Google ‘MSU” and ‘whiteboards’ and you will find well over a dozen stories in newspapers across the US. What made this topic worthy of news coverage? Students have often hung whiteboards on the outside of their doors so that they can leave messages for others, and for other students to leave messages for them. They were an early and physical medium analogous to digital social media. While there has been a history of complaints about particularly inappropriate words or images being written on whiteboards, the posting of a racist slur led the university to decide to ban them from the hallway doors in the coming year. This led to debate on and off campus about whether this was a reasonable and proportionate response to the problem. Given the simplicity of the technology behind whiteboards and their dry erase markers, it fascinated students in the masters course on media and information policy that this decision touched on so many issues. 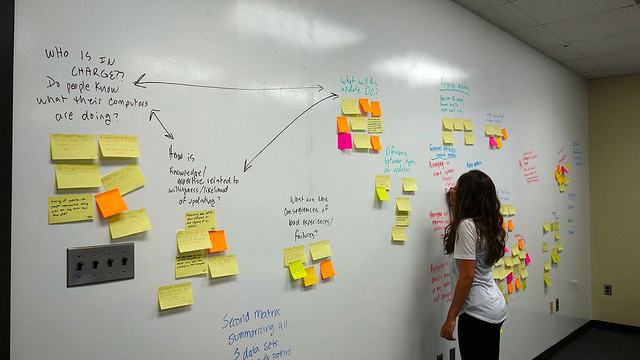 Discussion led this to become a student project at the Quello Center that focused on the issues surrounding the use of whiteboards in the dormitories at Michigan State University (MSU) as a case study. On the one hand, we have the university banning their use in student dorms. On the other hand, we find research centers on the campus painting entire walls to be used as white boards, as shown in photo. What led to the decision? Was it reasonable from the perspective of the variety of issues raised around hate speech and harassment to freedom of expression? What might be the impact of the decision?